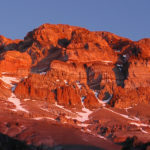 You will face an exciting experience and a great encounter with nature. 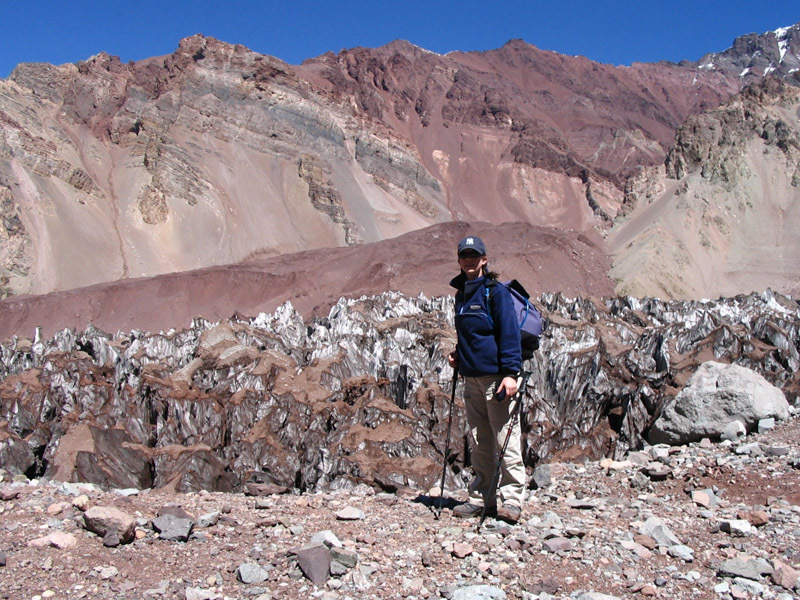 Adventure in the rivers of Mendoza, the best wine in one of the World’s Wine Capital , and the majesty of Aconcagua, the stone sentinel ,with 6892 m high. 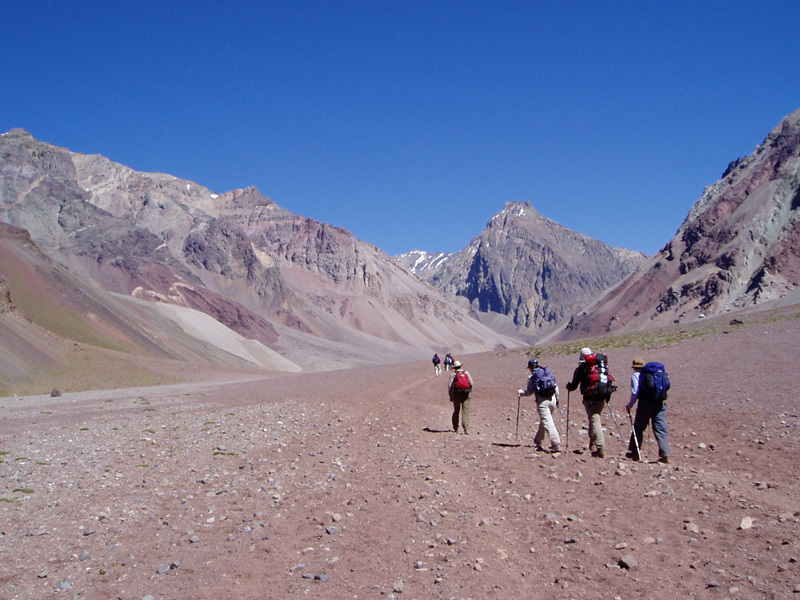 This experience will allow you to visit the main attractions of Mendoza: Urban space, where you can enjoy a unique city in the world, with its greenery and architecture. The local cuisine, a delight for the most demanding senses. The world of wine, with visits to wineries and obviously internationally recognized wine tasting. 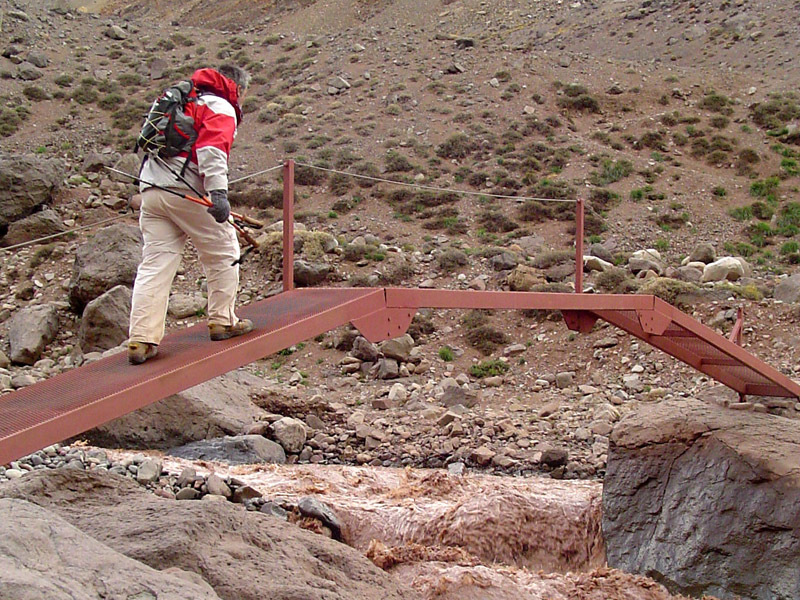 Adventure tourism, an adrenaline experience of rafting through the rivers of San Rafael. 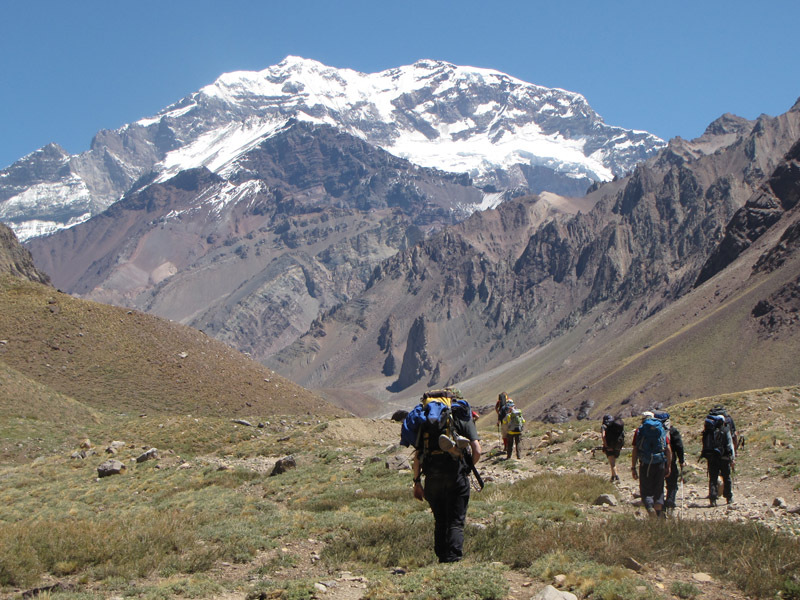 The Andes and their mountains, with a 3 or 5-day trekking where you can enjoy the most incredible views of Mt Aconcagua, the highest mountain in the America Continent. 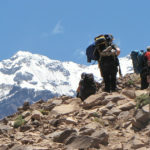 Day 01 - Arrival to Mendoza – Altitude: 760 mts. At an agreed upon time in the morning, our guests will meet our host, a wine specialist guide, to start the tour that will take them to the heart of the Central Winemaking Region, in the area of Luján de Cuyo or Maipú, where we will have the opportunity to get to know traditional and industrial wineries. We begin with a visit to two wineries, their vineyards, and tour their winemaking rooms, and cellars where the aging of the wine happens. Our guide will share his knowledge about the world of wine, providing detailed information about the properties of the soil, characteristic varietals of the region, care of the grapevines and conduction techniques, irrigation systems, defoliation of the vines, and pruning and grape harvest for maximum quality of the grapes. In the wine tasting rooms, you will be provided with detailed advice and indications for proper tasting. At midday it will be time to travel to the third winery and the vineyards that surround it. After finishing this visit, a gourmet lunch is organized that includes a range of wine lines in order to have the chance to put into practice all the newly acquired knowledge about tasting. In the afternoon, after lunch, you will have the opportunity to share your experiences and then we will return to the hotel to end a memorable day. 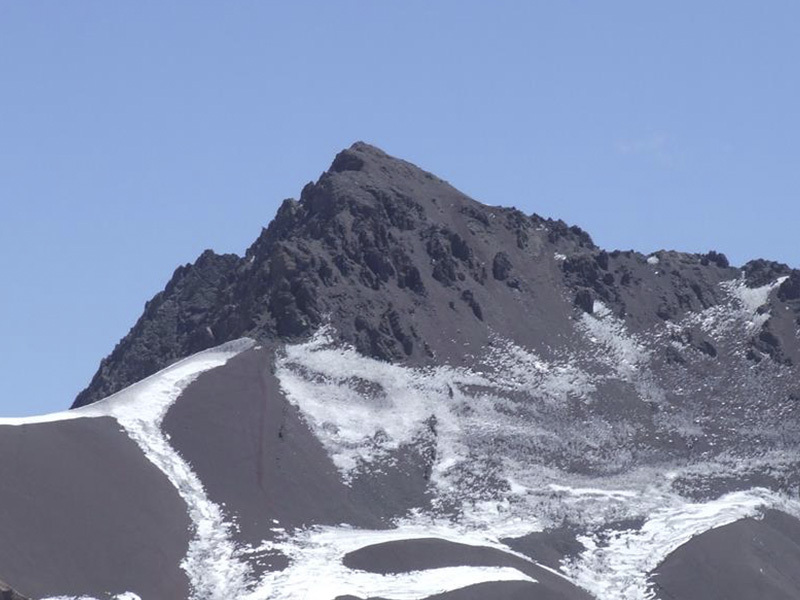 After traveling 250 km in our private vehicle, we reach San Rafael, a city in the south of the province of Mendoza. San Rafael is a real touristic choice due to the joint of imposing areas like Valle Grande, Cañón del Atuel, El Nihuil, Los Reyunos Dam and Lake, El Tigre Lake, Agua de Toro Dam, The old 25 de Mayo Village (among others) that provide the tourist with various alternatives to enjoy nature with peace and safety for the whole family. To enjoy this activity, it is necessary to head for the Grande Valley area, located approximately 40 km from the city center. 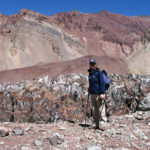 The Atuel River has II and III grade difficulty (in a scale ranging from I to VI, I being the easiest challenge and VI referring to areas where navigation is impossible). These conditions make this kind of rafting suitable for all ages. 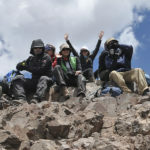 Once everything is ready, participants listen to the safety instructions and, after a few seconds, they are ready to feel adrenaline flowing through their bodies. 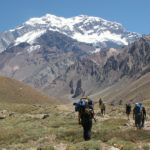 After this day, we return to the city of Mendoza to rest in our hotel and prepare to begin the trekking in Aconcagua. 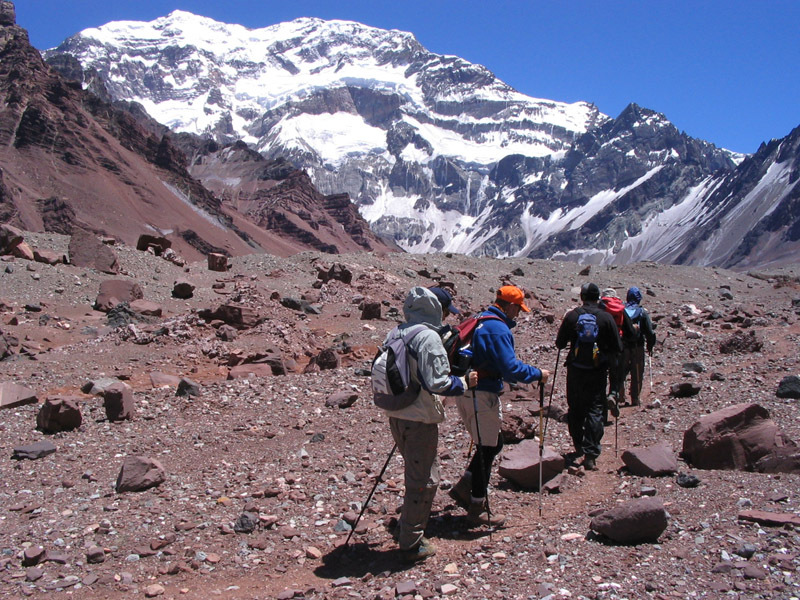 Day 05 · Mendoza - Penitentes - Confluencia– Altitude: 3368 m.
We will obtain individual entrance and ascent permits. You will be personally assisted in this procedure in our commercial office. 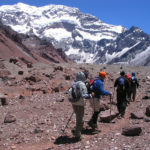 After this we travel to Villa de Penitentes, and then to Horcones Park Aconcagua Entrance, where we get our first view of the mountain. We will get our permits checked at the Ranger station. 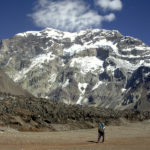 Then, we head off to Confluencia by walking 4 or 5 hours. 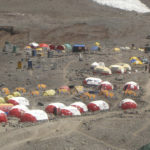 Day 06 · Confluencia – Plaza Francia - Altitude: 4.200 m.
Day 07 · Confluencia / Plaza de Mulas – Altitude. 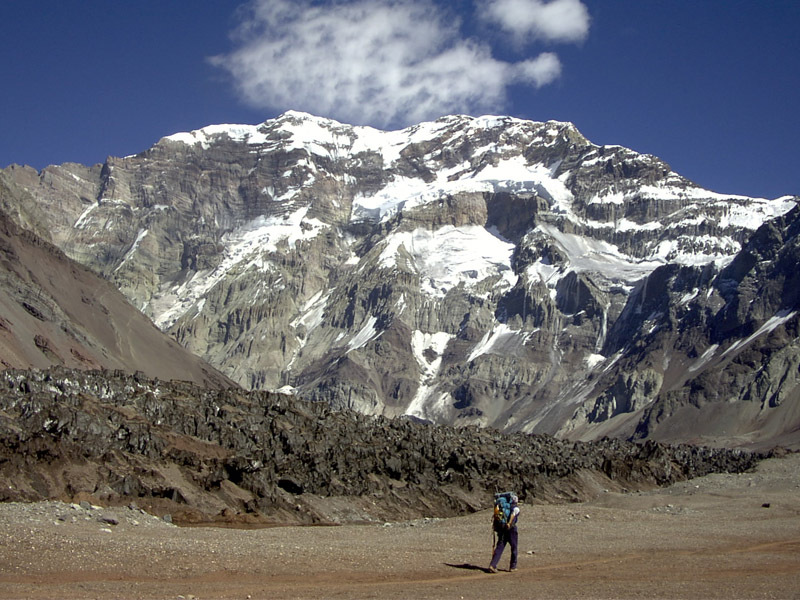 4.250 m.
We will begin our trekking to Plaza de Mulas base camp. After breakfast, we start our walk across “Playa Ancha” . We slowly gain altitude up to the Horcones Superior Valley. After hiking across Playa Ancha and climbing up through a very steep path, “Cuesta Brava” (meaning Rugged Slope), we reach Plaza de Mulas, at 4.250 m.
Day 08 · Rest in Plaza de Mulas - Altitude: 4.250 m.
This day is a rest day and a good occasion to explore the local terrain. 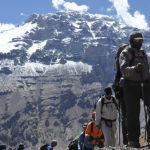 We will walk on Plaza de Mulas surroundings overcrossing the Horcones Superior Glacier, always with an incredible view of Aconcagua´s West Wall at sunset. 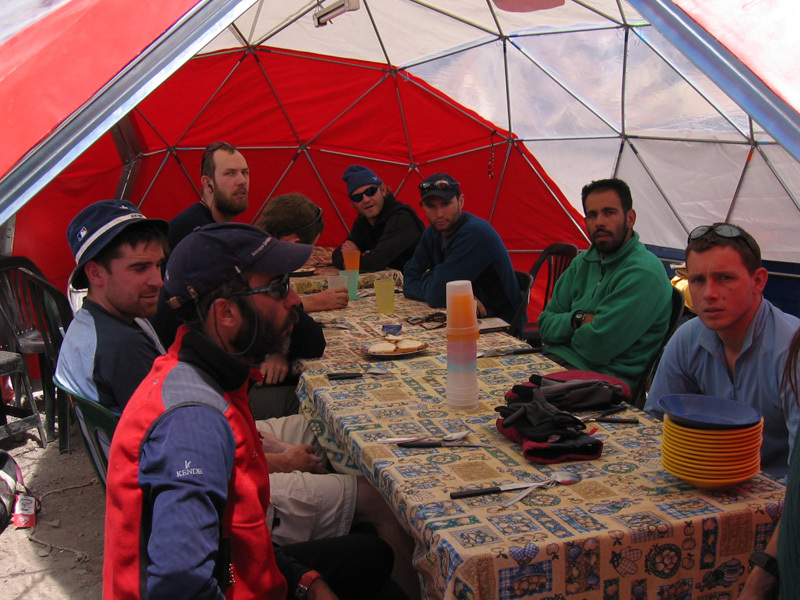 Plaza de Mulas is where hundred of expedition begins the expedition to the summit, so you can talk and share experiences with people of all around the world. Day 09 · Ascent to Mt. 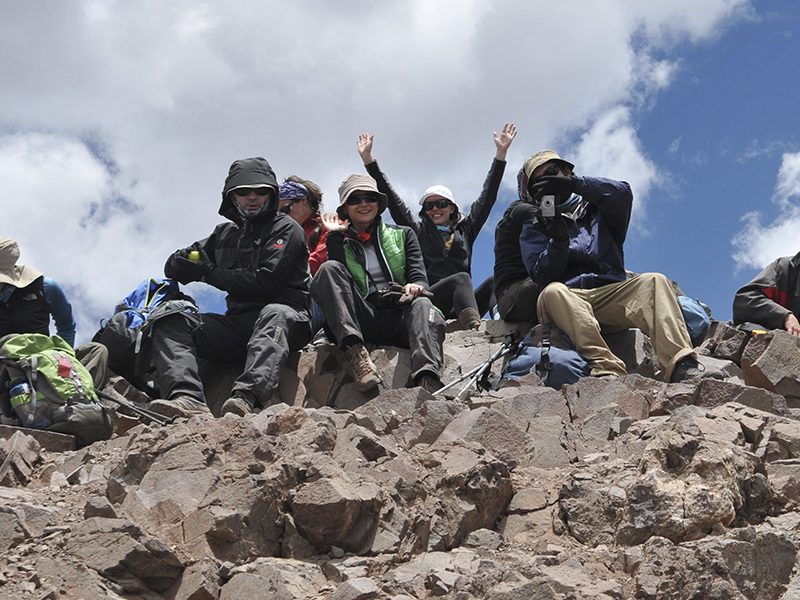 Bonete - Altitude: 5.000 m.
We will have a free day to discover the city of Mendoza, take a short excursion and enjoy this beautiful place in the world. After breakfast at the hotel we’ll take you to the airport, ending this journey of unique experiences. NOTE: The proposed itinerary can be changed due to weather conditions o other forced situations that put in risk the group security. 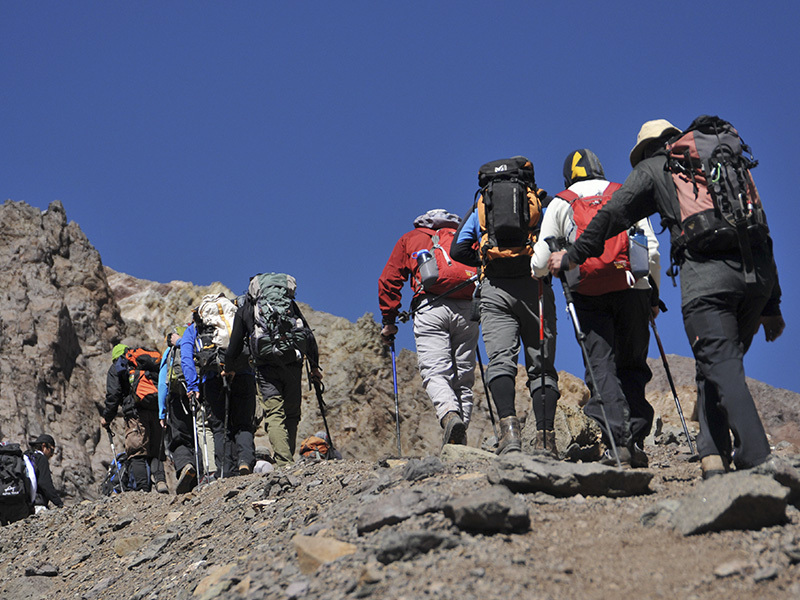 The guides have the authority to change the itinerary programmed according to their criteria. You can be sure the changes have two fundamental objectives. These are to maximize the security and the summit chances. 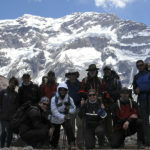 And they are based our guides knowledge and experience. Mountain Guide. 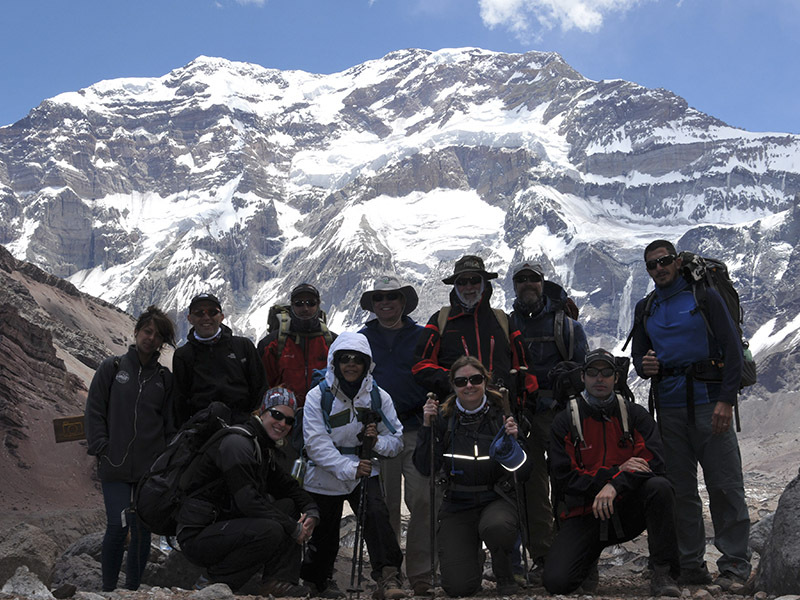 (Bilingual, experienced, professional, qualified to operate within Provincial Park Aconcagua). 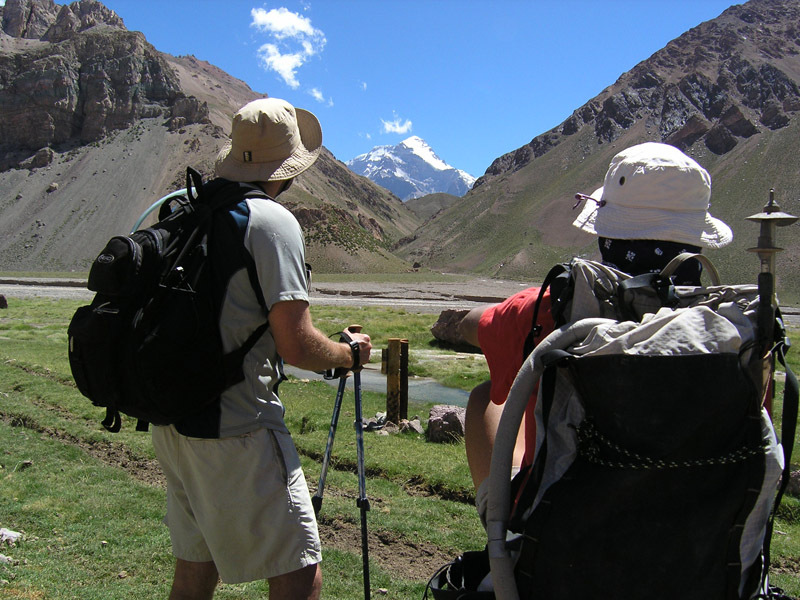 Transport IN-OUT Airport-Hotel in Mendoza by private vehicles. 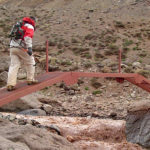 Transport IN-OUT Mendoza-Penitentes by private vehicles. 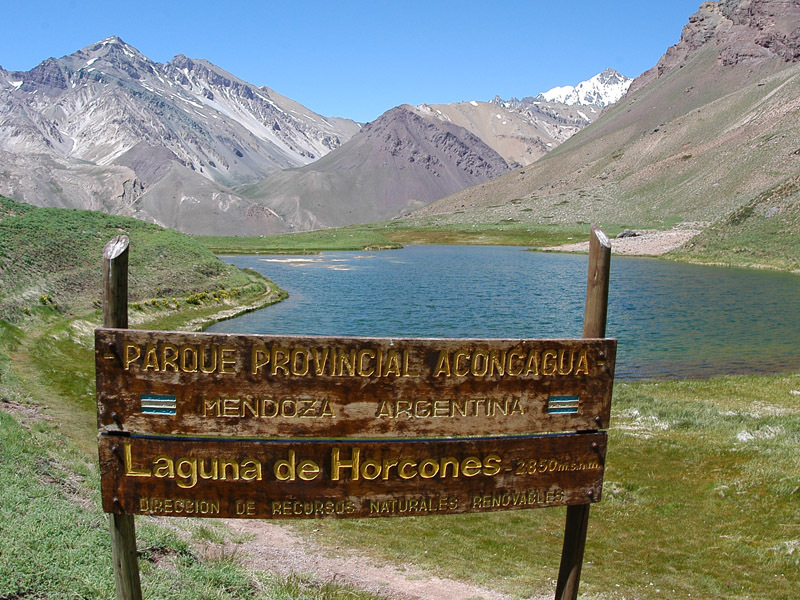 Transport IN-OUT Penitentes-Horcones (trailhead) by private vehicles. Five (5) nights accommodation in a 3* hotel in Mendoza City (Sharing room, Double/Triple occupancy), Breakfast and taxes included. One (1) night accommodation in a 3* hotel in San Rafael City (Sharing room, Double/Triple occupancy), Breakfast and taxes included. 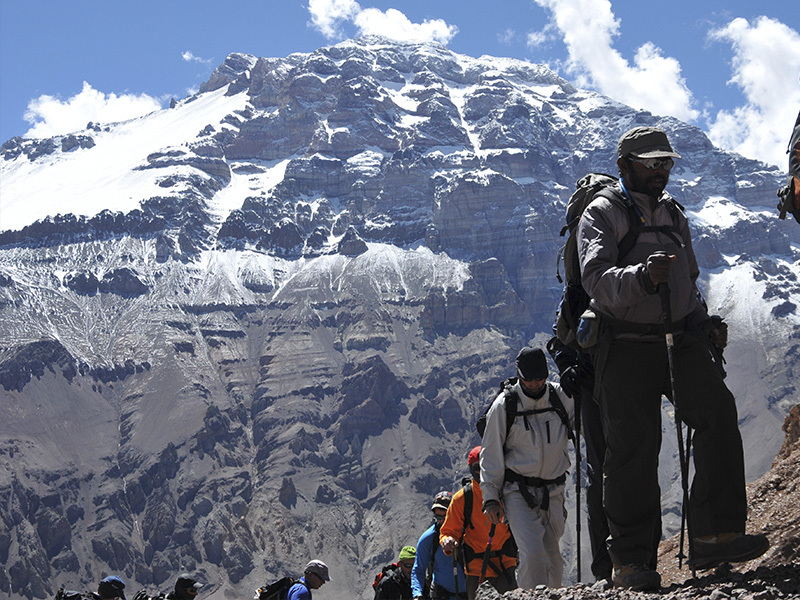 Assistance with the procedures to obtain the permit to enter the provincial Park Aconcagua. 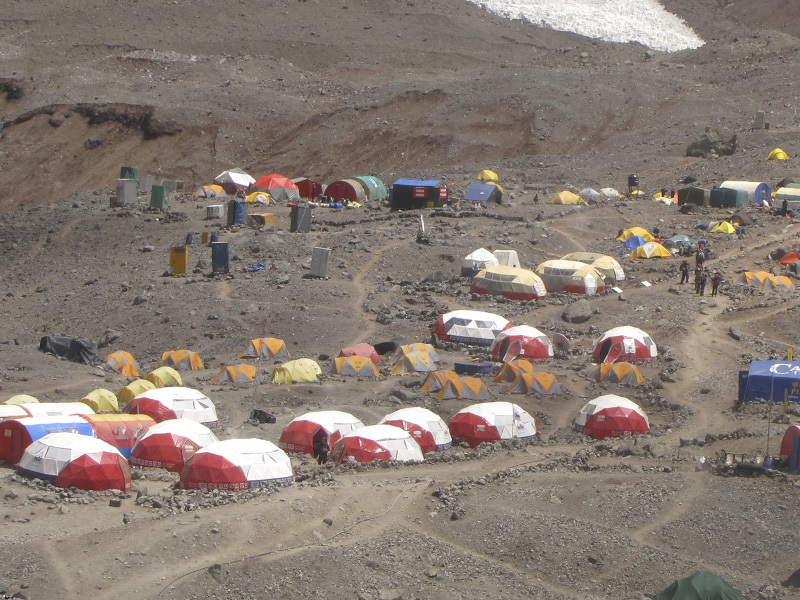 Sleeping tents and luggage storeroom. 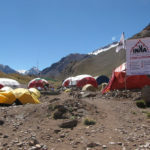 Fully equipped dining-room and kitchen and WC tents. 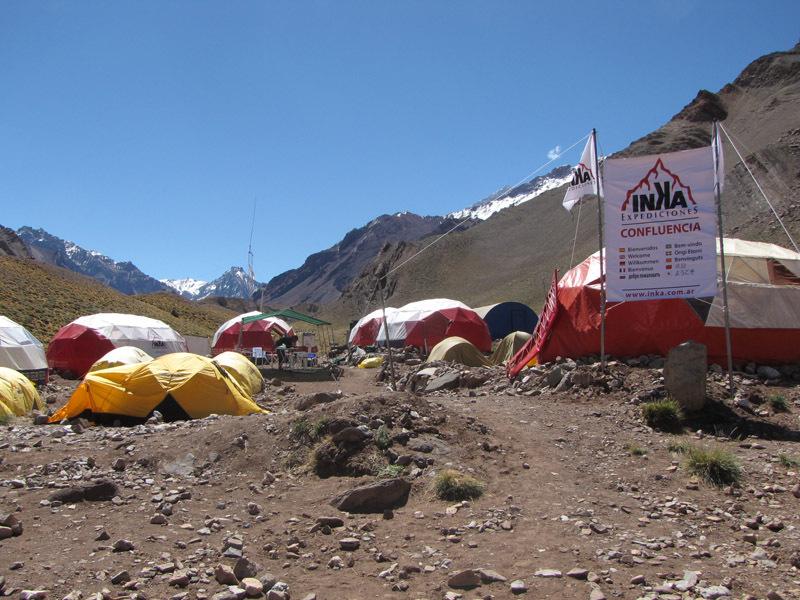 Radio for communications between high camps, base camp, Penitentes and Mendoza. Cook. 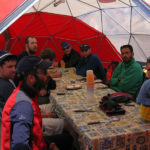 All meals included on the mountain. 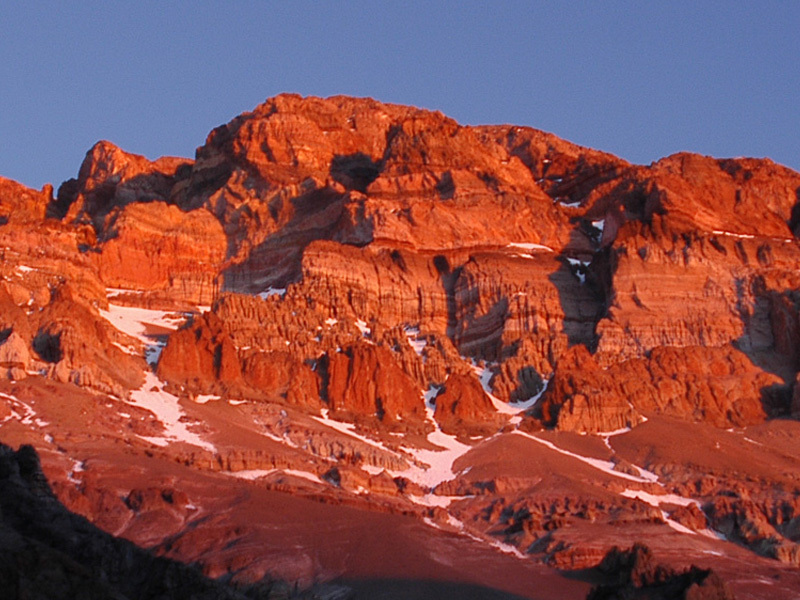 Aconcagua Park Entrance Permit fee: this permit is managed by government. THIS WILL BE AN ASCENT PERMIT. Personal equipment (please check the required equipment in this document). 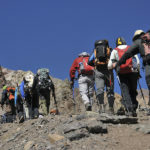 Personal expenses (tips, laundry, phone, drinks, satellite phone, internet access, showers, and personal porters to carry your personal equipment and your share of the common equipment). 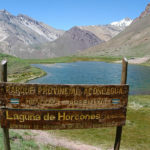 Extra nights in hotel in case of early return to the city decide to come back to Mendoza. 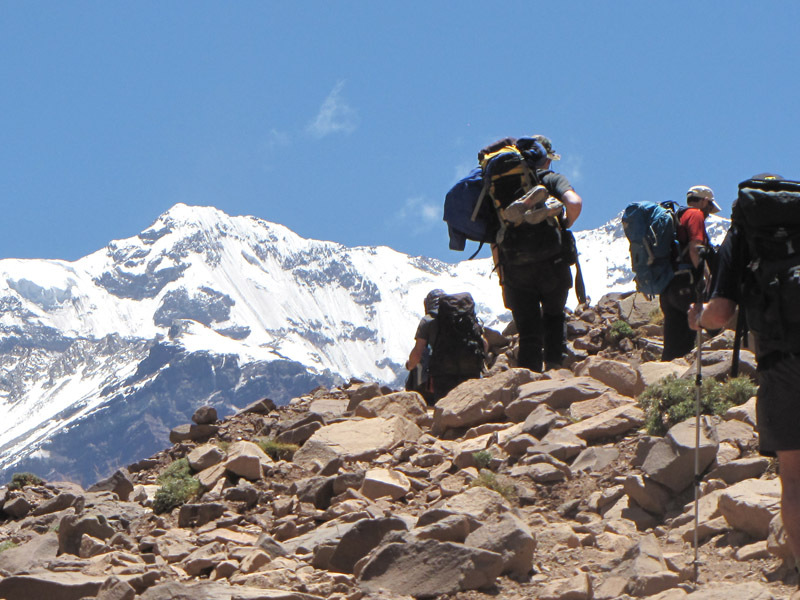 Transfer out to Mendoza in case of early returning or abandon the expedition. Meals and Drinks not specified in the itinerary. E.g. 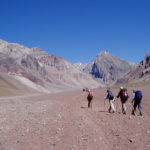 : Lunches and Dinners in Mendoza ,Uspallata, San Rafael, Penitentes. Any other service not detailed as included in the above paragraph. 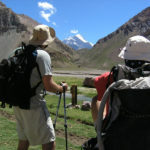 A “private trekking” is run exclusively for you, your own families or friends and also you can choose the departure date.